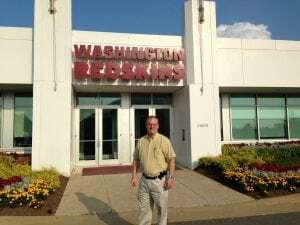 Dan Demaree, CEO, DPR Group at Washington Redskins Headquarters during SmartCEO100 Mixer. In the past year, I have joined two really good networking organizations, one of which is the SmartCEO100 of Washington, D.C. This has enabled me to get out from behind the desk and mingle with a group of like-minded CEOs and business owners.This past week, I attended the SmartCEO100 Social event at Redskins Park in Ashburn, Va. This was a private event organized for CEOs and business leaders from the Washington, D.C. chapter of the SmartCEO100. For the first half-hour, I mingled in the Redskins’ open lobby with more than 40 other CEOs and their invited guests, with an open bar and an impressive array of hors d’oeuvre. Then, some of the Redskins’ staff took us on a tour of the facilities starting with a walkthrough of the Redskins’ “bubble” or indoor practice facility. 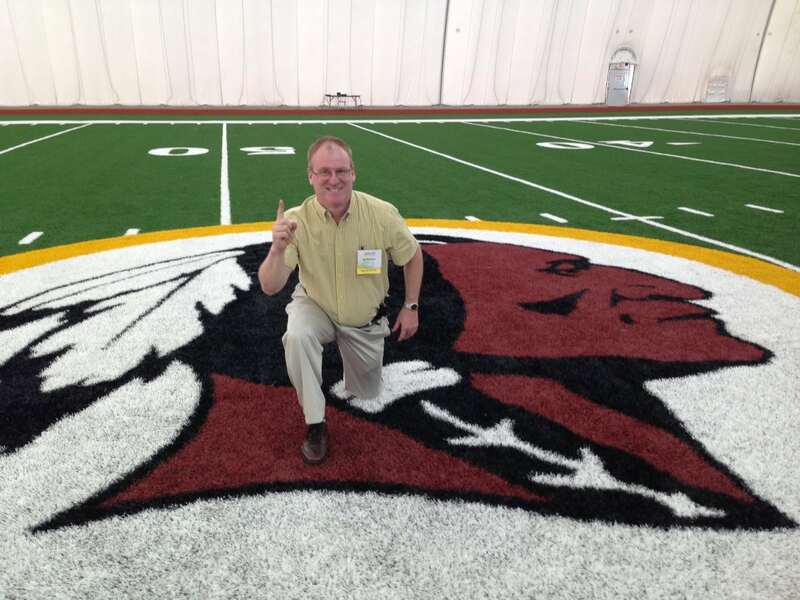 Several of us “hammed it up,” taking photos in various poses on the Redskins’ logo in the center of the field. Just walking across the AstroTurf had several CEOs almost ready to take off their shoes and socks to do 40-yard sprints. I said, “almost” ready! Finally, the entire group went into the team meeting area to hear Larry give us some inside information about what it’s like to work for the Redskins on a daily basis. It was an odd feeling knowing that we were sitting in the exact same seats that the players sit in when Coach Shanahan gives them their team briefings. During the evening, I spoke with several CEOs of companies that are looking for ways to increase recognition for their products and services in the marketplace. Since this is DPR Group’s primary area of expertise, I’m always happy to talk about it! From time to time, I will take another CEO or company owner along as my guest to network with other area CEOs and see what the SmartCEO100 is all about. So, if you know a CEO who you think would like to attend one of these events with me—in either Washington, D.C. or Baltimore—feel free to email me with their contact information.